ARCADIA -- It may not be a motto in the track program at Great Oak High School but depth equals dominance certainly could be. While Coach Doug Soles' Wolfpack are widely known for their legendary distance depth, it usually takes more than distance to win a track meet. While that's a debatable statement -- considering two exceptional distance girls nearly single-handedly pulled out a State team title last June -- meets like Saturday's CA Winter Championships aligns as an ideal showcase for Great Oak's strength even more than it's accompaniments, of which there was ample amounts of both. 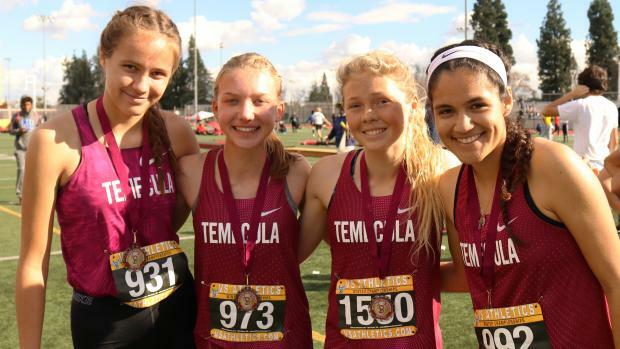 Depth was certainly the story on Saturday at Arcadia High School as Great Oak swept the boys and girls team titles at the CA Winter Championships for the fourth consecutive year. And the Wolfpack teams extended their streak of sweeps with particular dominance under varied skies on a crisp but dry Saturday in the shadow of the snow-dusted San Gabriel Mountains. 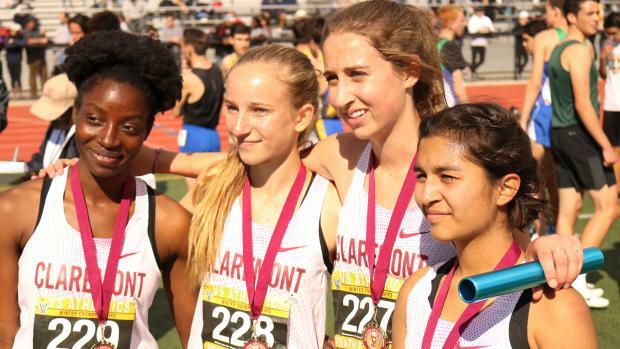 With junior Tori Gaitan winning the 1500- and 3000-meters, sophomore Summer Stevenson winning the triple jump and placing second in the long jump, and the the 4x800 team also winning, the Great Oak girls put up 70.5 points to outdistance runner-up West Ranch by 44 points. "I was impressed with Tori Gaitan running well despite being sick," Soles wrote in a text interview. The boys team also got strong performances in the distances plus runner-up finishes in field events by the Wright Brothers -- sophomores Jack and James -- in compiling 78.5 points. West Ranch, with Evan Bates winning the 1500 and Solomon Strader placing second in the 600 put up 34 points for second place, 44.5 points behind the Wolfpack. 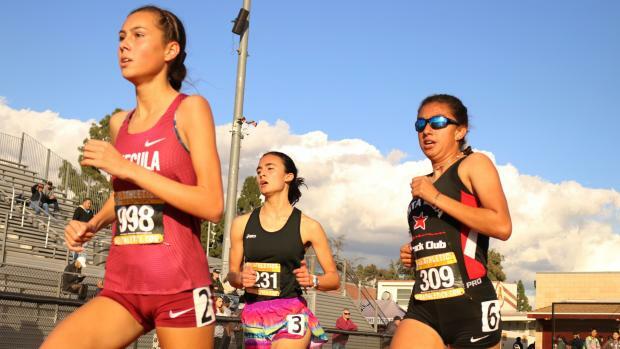 Of course it was a distance event that started the avalanche of points as Gaitan won the 1500, holding off an impressive challenge by Granada Hills freshman Sofia Abrego (4:40.02). Great Oak junior Arianna Griffiths was third (4:41.93), senior Fatima Cortes (4:50.06), running through a foot injury, was sixth, and sophomore Brianna Weidler was eighth. So, 20 points for Great Oak in the first final on the track. A year ago, Cortes, who has signed with Cal, pulled off the 15/3K sweep. She was candid about the program's goal for the day as a mindset for the upcoming spring season. "We've just been trying to score as many points as we can," Cortes said toward the end of the meet, "because we like to get that winning mentality." The Wolfpack boys picked up 16 points in the 1500 with junior Chris Verdugo placing second to Bates in 4:00.17 with junior teammate Cole Sawires Yager on his heels in third (4:00.56) and senior Tyler Tickner seventh (4:03.86). "I thought Chris Verdugo, Cole Sawires Yager and Ryan Shields stood out (Saturday) with big races," Soles wrote. Great Oak's Cameron Hylton and Leandro Candray went 3-4 for 11 points as the top four finishers ran sub-9 minutes in the 3000 meters. The race was won by Newport Harbor senior Alexis Garcia (8:57.78) with La Quinta sophomore Raen Reyes placing second (8:58.70). Next up in the long tradition of exceptional triple jumpers from the Stevenson family to circulate through Great Oak is the aforementioned sophomore, Summer. While her sister Ciynamon, a three-time State Meet medalist, and brother CJ, a two-time State Meet champion, are now both introducing the folks at Texas A&M how the Stevenson crew triples, it is Summer's turn to keep the family atop the podium in the event. On Saturday, she barely missed the meet record, leaping 39-feet-even on her third of four attempts to beat runner-up Shelbi Schauble, a junior at West Ranch, by nearly a foot. Stevenson was also second in the long jump to Orange Lutheran junior Sophia Hartwell (17-9). Also in the triple jump, two Great Oak sophomores accounted for three points as Jalissa Johnson placed seventh and Delaya Grimes was eighth. The boys DMR was a different story as the race came down to a finish among Great Oak teammates -- Tyler Tickner and Cameron Hylton -- representing the Wolfpack's A and B teams, respectively. Tickner, who anchored the team that included Chris Verdugo, Mateo Joseph and Ryan Shields, got to the line first, completing the 10:41.64 journey. Hylton crossed in 10:44.55 for the team that included Cole Sawires Yager, Micah Baird, and Grayson Boyce. Because meet scoring rules stipulate that only one team per school can score in a relay, the Claremont team of Aaron Reyes, Isaac Martinez, Vicente Huerta and Ryan Cowgill crossed in 10:50.69 for third on the track but earned the eight points in the the scoring. Great Oak swept the 4x800s, with the team of Kendall Harrison, Brianna Weidler, Arianna Griffiths and Fatima Cortes running 9:41.32, seven seconds ahead of runner-up Dana Hills to win the girls race. The boys 4x8 lineup of Boyce, Verdugo, Joseph and Shields ran 8:02.91 with Dana Hills next in 8:03.55. Both boys teams surpassed the previous meet record of 8:05.29. Away from the distances, the GO boys got points in the field events from the aforementioned Wright twins. Jack Wright, a pole vaulter, cleared 15-01 to place second to Quartz Hill senior Daniel Palacio, who also cleared 15-01. James Wright, a thrower, placed second in the weight throw (57-08.50 PR) and seventh in the shot put (48-03 PR), adding 10 points to the GO haul. Wolfpack junior Nicholas Meeker placed eighth in the shot, adding one point to the accumulation. In that weight throw competition, junior Ben Chappell (Oakdale/SJ) won with a PR of 60-04.50. Wright's best throw was 57-08.50. In the shot put, Esperanza junior Jeff Duensing, runner-up here a year ago and also at the CIF State Meet to Bakersfield Liberty's Daniel Viveros, got a little revenge on Saturday, winning the event with a best of 64-00. It was a PR well beyond his 61-06.75 previous best from last June's State final. Viveros was second in 61-11. The boys shot put was one of many other showcase events that did not disappoint on Saturday. Photos by Brandon Miles and Jeffrey Parenti. For more photos, check out Lizette Adam's photo album.